Club Red, the University Club for faculty and professional staff, will meet in the Wang Center’s J Club (new location) on Friday, October 6, 2017 from 4:30 – 6:30 p.m. The complimentary food offering is sponsored by Teaching, Learning & Technology/Fidelity. Wine and beer will be available at $5 and soft drinks $2. RSVP is requested http://clubred.stonybrook.edu/) so that our CulinArt, our highly regarded caterers can plan accordingly. Club Red, the University Club for faculty and professional staff, will meet in the J Club located in the Charles B. Wang Center (new location) on Friday, September 15, 2017 from 4:30 – 6:30 p.m. The complimentary catering is sponsored by Dean Sacha Kopp. Wine and beer will be available at $5 and soft drinks $2. RSVP is required at (http://clubred.stonybrook.edu/) to ensure that the highly regarded CulinArt can plan accordingly. Interested in sponsoring a Club Red? Please fill out the form found on this linked page – dates are already running out for Fall 2017 – so get your request in soon. Club Red is Back for the 2017 Fall Semester – 1st Event Sponsored by President Samuel L. Stanley Jr.! Club Red, the University Club for faculty and professional staff, will meet in the J Club located in the Charles B. Wang Center (new location) on Friday, September 8, 2017 from 4:30 – 6:30 p.m. The complimentary catering is sponsored by the President Stanley. Wine and beer will be available at $5 and soft drinks $2. RSVP is required at (http://clubred.stonybrook.edu/) to ensure that the highly regarded CulinArt can plan accordingly. Club Red, the University Club for faculty and professional staff, will meet in the Simons Center Café on Friday, April 21st from 4:30 – 6:30 p.m. The complimentary catering is sponsored by the College of Arts and Sciences. Wine and beer will be available at $5 and soft drinks $2. RSVP is requested at (http://clubred.stonybrook.edu/) to ensure that our highly regarded Chef Paolo can plan accordingly. 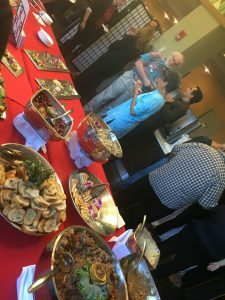 Club Red is intended as an informal gathering opportunity for faculty and staff from all departments in the University, East and West Campuses. Attendance is not limited to people affiliated with the sponsor. Your support and attendance are welcomed (and vital!) to establish a more permanent University Club and facility at Stony Brook. You can support Club Red events by purchasing a personal membership. Details can be found here. To sign up for our mailing list for Club Red events, use this link: https://clubred.stonybrook.edu/join-our-mailing-list/ or click on the “subscribe” link at the bottom right part of the website you are currently reading. Club Red this Friday, Sponsored by DoIT and TLT! Club Red, the University Club for faculty and professional staff, will meet in the Simons Center Café and lobby on Friday, April 14th from 4:30 – 6:30 p.m. The complimentary catering is sponsored by the DoIT and Teaching, Learning & Technology. Wine and beer will be available at $5 and soft drinks $2. RSVP is requested at (http://clubred.stonybrook.edu/) to ensure that our highly regarded Chef Paolo can plan accordingly. Are you interested in hanging out off campus on non-sponsored fridays (4:30-6:30)? Club Red, the University Club for faculty and professional staff, will meet in the Simons Center Café and lobby on Friday, March 3rd from 4:30 – 6:30 p.m. The complimentary catering is sponsored by The Graduate School and School of Professional Development. Wine and beer will be available at $5 and soft drinks $2. RSVP is requested at (http://clubred.stonybrook.edu/) to ensure that our highly regarded Chef Paolo can plan accordingly. Additionally, I’d like to you to encourage you to start booking our Spring 2017 dates for sponsorship. Please consider having your group, department, college or school sign up for a Friday Club Red. !!CORRECTION!! No Club Red this week. Feb 24 will be sponsored by CEAS !!CORRECTION!! Club Red, the University Club for faculty and professional staff, will meet in the Simons Center Café and lobby on Friday, Feb 24th from 4:30 – 6:30 p.m. The complimentary catering is sponsored by Dr. Fotis Sotiropoulos.and the College of Engineering and Applied Sciences. Wine and beer will be available at $5 and soft drinks $2. RSVP is requested at (http://clubred.stonybrook.edu/) to ensure that our highly regarded Chef Paolo can plan accordingly. Additionally, I’d like to you to encourage you to finalize booking for our Spring 2017 dates – sponsorships are filling up quickly! Please consider having your group, department, college or school sign up for a Friday Club Red.